The group is fighting a huge pack of aggressive monkeys. In the midst of the fight, the monkeys suddenly and unexpectedly retreat, as if the Gamemakers are calling them away. Alone, Peeta, Finnick, and Katniss notice the tribute from District 6. The monkey’s bite has seriously injured her, and she’s bleeding copiously. Peeta holds the tribute, who looks grotesquely thin because of her dependency on morphling. Peeta sings her a childish song about color, and the song seems to please her. Slowly, she dies, and at the exact moment when she exhales her last breath, the cannon fires, indicating her death. It’s interesting that Peeta, who’s been slow and physically clumsy so far, excels at a different kind of task: soothing a dying woman. Peeta has a reputation as a strong, athletic victor, but from what we’ve seen, he excels at more peaceful—or even more stereotypically feminine—pursuits, like baking, painting, and singing. We’re reminded of the precision of the Hunger Games as a media spectacle as well, as the cannon measures the lives of the tributes down to the last second. Exhausted from their fight with the monkeys, the group of three makes its way into the jungle in search of a big tree. They find one, and use the spile to draw more water from it. It is almost dawn when they’ve finished drinking. Katniss and Peeta go to rest, trusting Finnick to guard them. Finnick makes nets and baskets, which he uses to catch shellfish. When Katniss wakes up in the mid-morning, Finnick greets her with food. Once again, Finnick proves himself to be a generous, resourceful, and generally excellent ally. We’re no more sure of why he’s helping Katniss and Peeta, but it’s clear that his desire to help goes beyond his immediate self-interest. In a game where immediate self-interest is all-important, this is remarkable. Katniss realizes that she’s been scratching her skin in her sleep. She goes to wash in the salt water, and mutters to Haymitch, who’s watching the footage, that they could use some skin care. Almost too quickly, a parachute lands nearby. Attached, there is ointment, which Katniss, and then Finnick, apply to their skin. Finnick and Katniss tease each other about their hideous skin, and they seem to be enjoying each other’s company. Another parachute arrives, this one carrying a loaf of bread. Katniss interprets the timing of this parachute to mean that she should continue being friends with Finnick. It’s interesting that Katniss has to interpret the messages that Haymitch and the other observers send to her. This parallels the way that others must interpret the mockingjay, and how President Snow paired Cinna’s beating with the start of the Hunger Games. In the absence of clear, explicit meaning, the characters have to use their interpretive skills to understand what’s going on, with mixed success. Katniss does some math: they’ve been in the Games for about 24 hours. There are thirteen tributes remaining, most of whom are in the jungle, and some of whom are Careers. Suddenly, a huge wave hits the island, flooding the beach. The group manages to run to dry land before they’re drowned, but the cannon indicates that another tribute hasn’t been so lucky. Half of the tributes are now dead. Collins reminds us of the “standings” in the Games at several points. Here, a giant wave sets the Games halfway between beginning and ending: exactly half of the tributes are dead, and half are alive. Katniss, Finnick, and Peeta notice another group of three in the distance. They’re “in bad shape,” with one member almost unable to walk. They are all covered in red paint. Finnick realizes that one of the members of the other group is Johanna, and he runs toward her. Katniss and Peeta run after him, seeing that the other two tributes are Beetee and Wiress. It’s interesting that Finnick runs to Johanna right away. This could suggest that they’ve previously made an alliance with one another, which may conflict with Finnick’s alliance with Katniss and Peeta—or it may be more evidence of a larger plan beyond Katniss’s knowledge. The group meets up with Johanna, who explains that she, Beetee, and Wiress ran through a rainstorm of blood, hence the appearance of red paint. Beetee has also sustained a knife in the back, and Wiress is in shock—she continuously mutters, “tick tock.” Johanna is brusque and harsh with Wiress, although she tells Katniss that she saved Wiress’s life “for Katniss”—Katniss has no idea what this means. Katniss doesn’t attack Wiress, because Finnick seems to be friends with her. Unlike Finnick, Johanna seems insensitive, rude, and dismissive of all those who are older and feebler than she. She is, in many ways, the ideal Hunger Games competitor: a cold, unfeeling killer who doesn’t pity the weak, but uses other people’s pity to survive. Katniss tries to care for Beetee. She takes a clump of moss and soaks it with saltwater, then applies it to Beetee’s knife wound. Meanwhile, Finnick catches more shellfish, and explains to the new members of their group how they came to be on the beach. Katniss explains how they lost Mags: Katniss wasn’t strong enough to carry her. Although Finnick is cool and calm, Johanna points out to Katniss that Mags was his mentor, and “half his family.” Katniss feels both angry and guilty. Katniss displays some of the same qualities and skills that made her mother such a valuable nurse in District 12. Katniss has also learned that she can’t always be gentle with people: sometimes, she needs to use medicines that are painful in the short term but better in the long run. Thus, she rubs salt in a wound—the proverbial painful medicine. Katniss sits on the beach with Wiress, who continues to mutter, “tick tock.” She thinks about the twelve rings she heard last night, and the peculiar shape of the arena. Danger has come to each sector of the arena, seemingly either at midnight or noon. Suddenly, it hits her. Wiress was right: the arena is structured like a clock. Once again, it’s Katniss who listens closely to the weak and unstable “outsiders,” discovering valuable information in the process. She’s strong and brave, but she’s also compassionate, and knows how to communicate and extract useful information from others. Arn, Jackson. "Catching Fire Chapter 22." LitCharts. LitCharts LLC, 4 Nov 2015. Web. 24 Apr 2019. Arn, Jackson. "Catching Fire Chapter 22." LitCharts LLC, November 4, 2015. 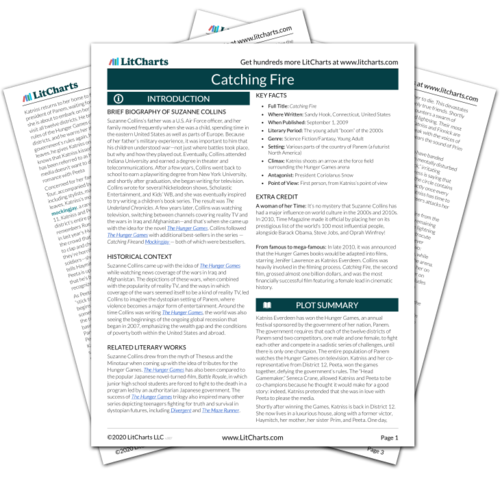 Retrieved April 24, 2019. https://www.litcharts.com/lit/catching-fire/chapter-22.